Series 03 Table Lamp, “smoke” acid patinated brass with stitched goatskin parchment shade, 2019. Series 04 Floor Lamp, height adjustable. Polished nickel plated brass, goatskin parchment shade with hand dyed leather trim, 2018. Untitled Side Table, machined and nickel plated solid polished brass with recessed hex-head fasteners, 2018. Series 03 Sconce, corded plug-in version. "Smoke" polished brass acid patina with goatskin parchment shade and hand-dyed braided cotton cord, 2018. Series 03 Floor Lamp, "Smoke" polished brass acid patina with goatskin parchment shade and hand-dyed braided cotton cord, 2018. Series 02 Small Sconce, polished unlacquered brass with lunar white goatskin shade, reversible orientation, 2018. Untitled table variations study, 2017. Series 02 Table Lamp, polished unlacquered brass with cream goatskin parchment shade, 2017. Untitled Side Table, polished unlacquered brass and matte blackened brass, 2017. Series 02 Floor lamp, polished unlacquered brass with lunar white goatskin shade, 2017. Series 01 Upright sconce, polished unlacquered brass and graphite leather, 2017. Series 01 Small Pendant, ash leather and dark patinated brass, 2016. Series 01 Large Sconce, sable leather and dark patinated brass, 2016. Series 01 Sconces (Small and Large), 2016. Coffee table in Paonazzo marble, black polished acrylic and high gloss oil on wood; Series 01 floor lamp in charcoal leather, 2015. Series 01 floor lamp, "ash", 2015. Series 01 desk lamps, 2015. 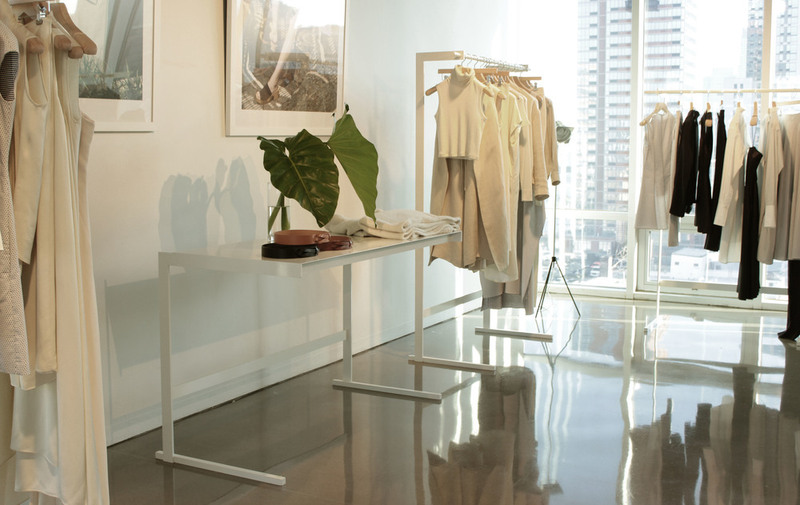 "Untitled" showroom racks and tables for Rosetta Getty and Creatures of the Wind, painted steel, 2014. First prototype of the Series 01 Desk Lamp, serial number 01-001. Leather and brass, 2014. Barrel chair in olive burl, hand-dyed velvet, and french polished paper on wood with ink and oil paint inscription, 2014. Desk lamps in leather, mahogany, brass and acrylic, 2014. Hanging light fixture prototype, deer hide and steel, 2013. Custom dining table, black glass and steel (shown with original Nakashima dining chairs), 2010. Banquette in velvet and cotton twill; Armchair in velvet and leather. 2010. Custom bronze and marble conference room tables for The Row, 2010. Shelves, steel and masonite, 2010. "Standard Edition" desk chair in waxed hard maple, 2010. Sofa in glazed linen, 2009.